Harriet Beecher Stowe House Reflects Her Inspiring Life | Write to the Point! HARTFORD, Conn. – Walking into Harriet Beecher Stowe’s home, just knowing she’s a famous American writer, I was curious about her life. I walked out having more knowledge about this wonderful woman. Stowe was a writer, painter and abolitionist born to a big religious family in Litchfield, Conn., in 1871. The Rev. Henry Ward Beecher, an abolitionist, was her brother. She married an American biblical scholar, Calvin Stowe, in 1836. They were the parents of seven children. One of Stowe’s daughters was named after her husband’s late wife, a common practice at the time. But Stowe lost four of her children before her death. She used writing as a way to cope with their deaths. house in Florida. At the time, the novel became the second most popular book, after the Bible. At Stowe’s home in Hartford, she was the neighbor of another famous author, Samuel Clemens, who wrote under the pen name Mark Twain. 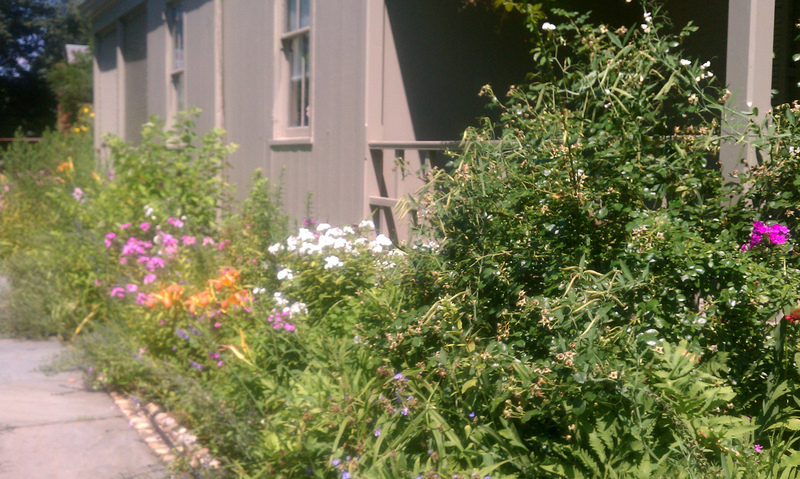 The only type of science that women could study then was gardening, so Stowe did. Her home today still has a beautiful garden that I found a pleasure to walk through. Stowe was inspired by plants and included them in most of her paintings. Magnolias were the flowers she said she could identify with because it represents strength and she was a strong woman. One of her daughters inherited Stowe’s talent for painting. In the master bedroom of their Hartford home, a self-portrait the girl created – her face inside a sunflower – is hung next to the desk where letters were written. A traditional wife, Stowe believed that a woman should know how to operate everything in her house. When the husband went off to work, there work was at home. Stowe had two servants working at her house, some were emancipated slaves. Her servants lived in the attic of her home. But having servants didn’t stop Stowe from doing her womanly duties around the house. She cooked and cleaned. She was a part of the women’s rights and suffrage movement and included this issue and many other topics in her writings. Stowe also wrote travel books, textbooks and more, producing a book a year, for 30 years. Under five feet tall, she was a little woman, but left a big impact on not only literature, but history.